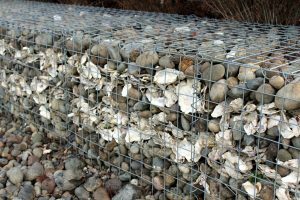 Never heard of a gabion? Don’t worry – you aren’t alone. We hope to change that relative obscurity! a wirework container filled with rock, broken concrete, or other material, used in the construction of dams, retaining walls, etc. In simple terms, a gabion is a wire basket filled with rocks to form walls, barriers, curbs, fences and whatever else you can think up. These are amazingly strong structures and take a fraction of the time to construct a standard mortared or stacked rock wall would. Gabion can be exceedingly beautiful and although they have been around for a while, they have a pleasingly modern look. To construct a gabion is easy. First, figure out the use, the height, and the width of your gabion project. The taller the gabion, the stronger the wire need be and the more ties you will need to install. For structural elements, like tall walls, you will probably need some sort of framework to the gabion to. Once you have your ideas down and a plan, you need to decide what to fill your gabion with. Typically, gabion are filled with rip rap. Here in Florida, we are lucky to have a beautiful lime rock we use for rip rap. Rip rap basically means loose rocks or stones used to prevent erosion, create sea walls, cover slopes, and or for beefing up foundations. The type of stone changes with geographic location. If you live in a granite rich area, you will be able to source granite rip rap. Not too many stones here in Florida – so we use earth mined lime rock. Our rip rap has a lovely white coloring, and an interesting, rustic texture. Finding shells and fossils in our rip rap is not uncommon. Need a new fence? Retaining wall? Or just want to try something different? Why not give a rip rap gabion a try? 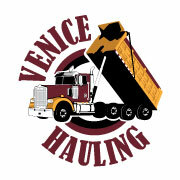 When you are ready, let us know and we’ll deliver your rip rap right to your project site.